Producing a competitive and high-yielding crop begins with the seed. It is important to begin with seed that will germinate and emerge uniformly and quickly, producing a vigorous seedling that can compete with emerging weeds. In cereal grains, large, high-protein seed that is free from threshing or storage damage will result in the most vigorous plants, as well as the highest yield. In other species such as dry pea or dry bean the seeds are so large that the impact of sizing for seed may be limited except if the small seed is diseased. There may also be considerable variation in seed vigour between varieties that is not related to seed quality. Current seed vigour tests may be of some value in eliminating poor vigour seed lots. When using home grown seed a 5 day germination test may give a reasonable estimate of seed vigour. Research has shown that for cereal crops, large seeds tend to produce more competitive, higher-yielding plants than small seeds. In one greenhouse experiment, oat seeds were classified according to size (small, medium, and large) and then were grown alone, and together with wild oat. Oat plants from large seeds (35 mg) were bigger and produced more panicles than plants from small seeds (15 mg). The plants from large seeds also competed better with wild oats. The wild oats that were grown with oat plants from large seeds were smaller and produced fewer panicles than those that were grown with oat plants from small seeds (Willenborg et al., 2005). Field studies on wheat have shown that seed size has a significant effect on the yield and the competitive ability of the crop. In Montana, using large seed increased wheat yield by 18% (Stougaard and Xue, 2004), reduced wild oat biomass and seed production by 25% (Xue and Stougaard, 2002) and increased economic returns (Stougaard and Xue, 2005) compared to when small seed was used. Under weed free conditions, the value of larger seed may not be as significant. Using large seed is a practice that can easily be combined with other practices to enhance the competitive ability of the crop. In the studies by Stougaard and Xue, increasing crop seeding rate also increased wheat yield and suppressed wild oat. 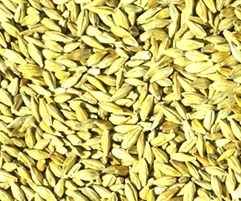 The effects of the two practices were additive, resulting in a total wheat yield increase of 30%. Use seed that is large, high-protein, and free from damage to result in the most vigorous crop. Stougaard, R.N. and Q. Xue. 2004. Spring wheat seed size and seeding rate effects on yield loss due to wild oat (Avena fatua) interference. Weed Sci. 52:133-141. Stougaard, R.N. and Q. Xue. 2005. Quality versus quantity: spring wheat seed size and seeding rate effects on Avena fatua interference, economic returns and economic thresholds. Weed Research 45:351-360. Willenborg, C.J., B.G. Rossnagel and S.J. Shirtliffe. 2005. Oat caryopsis size and genotype effects on wild oat – oat competition. Crop Sci. 45:1410-1416. Xue, Q. and R.N. Stougaard. 2002. Spring wheat seed size and seeding rate affect wild oat demographics. Weed Sci. 50:312-320.